Arnica 30x by Hyland's is amazing and its quality is solid.I recommend it.It provides quality help without ugly side effects. I like taking Arnica 30x by Hyland's because I find that it helps with my aches and pains. It was recommended by my sports physical therapist. Ive used these before facial surgery and they really help prevent bruising. I begin taking 2-3 pills 3 times per day about 5 days prior to the surgery - and then the same dosage for about 5 days afterward. Hyland's Arnica 30x is the smart choice for relieving both everyday pain or acute injury. This new pain relief formula speeds your recovery from injuries and trauma. You can even take it before activity to minimize pain later. 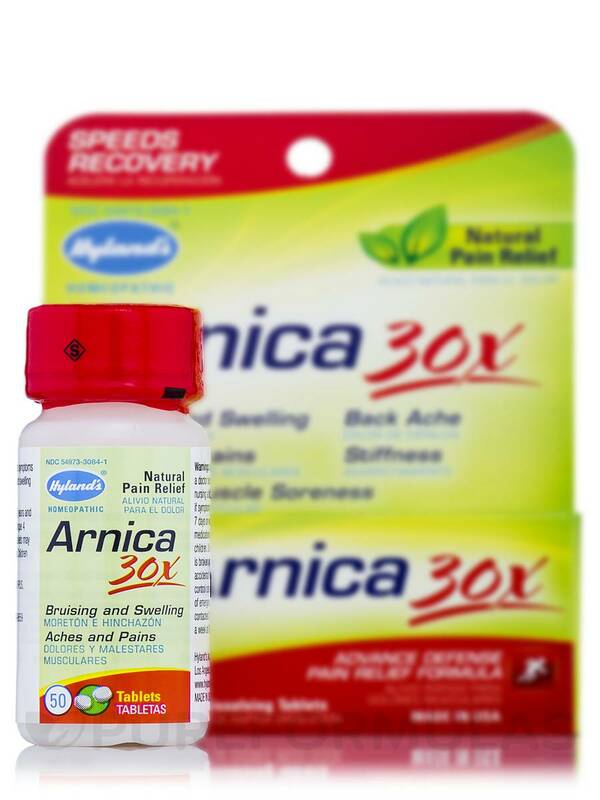 Arnica 30x relieves pain from joint & muscle soreness‚ bruising‚ swelling‚ stiffness‚ back ache‚ fatigue and inflammation. Arnica Montana 30X HPUS / Bruising‚ swelling‚ stiffness‚ muscle soreness and pain. Inactive Ingredients: Acacia gum‚ lactose. Adults and children 12 years and over‚ dissolve 1-2 tablets under tongue every 4 hours‚ or as needed. If the initial dosage is not providing relief‚ dissolve 1 tablet under tongue every 15 minutes‚ for up to 6 doses. Children 6 years to under 12 years‚ dissolve 1 tablet under tongue every 4 hours‚ or as needed. If the initial dosage is not providing relief‚ dissolve 1 tablet under tongue every 15 minutes‚ for up to 6 doses. As with any drug‚ as a doctor before use if pregnant or breast-feeding. In case of accidental overdose‚ contact a medical professional or Poison Control Center immediately. Do not use if printed tamper band is broken or missing. In case of emergency‚ contact a medical professional or Poison Control Center immediately. So amazing and happy to be able to take a supplement that helps with pain, fever, overall everything without horrible side effects! Pure rescue! I always take Arnica 30x by Hylands before going to bed for my muscles and assures the next day to be a good one. No side effects and how it makes me feel better. I use Arnica 30x by Hylands myself and for my dogs as an effective pain relief for sore muscles and joints. It is a natural pain relief and is safe for dogs. Arnica 30x by Hylands works almost instantly (really) for soreness from any kind of trauma, helps soreness when you exercise. Wonderful for backache. Helps Surgery soreness and bruising. Great for plastic surgery bruising. Start taking before and after surgery. It's a miracle! Inexpensive and it works fast. Easy to use just follow directions. Nothing to dislike that I've found.